Is there a more singular author than Cormac McCarthy? If so, I struggle to think who they might be. 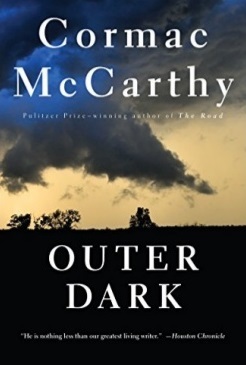 Outer Dark is McCarthy’s second novel, but if you didn’t know that going in it wouldn’t be all that easy to place. His style seems to have emerged fully-formed and unmistakable, and has fluctuated little even as he drifts from dark parables to picaresque and Appalachia to Apocalypse (though apocalypse in one form or another is never that far away in a Cormac McCarthy novel). It was a style I tried to ape for awhile before setting it aside, chafing from its poor fit and embarrassed by my own lack of originality, but it tantalizes me still. A surreal brew of long commaless sentences, archaisms, inverted syntax, and quasi-biblical grandeur, and an almost complete lack of access to the character’s interior. I can’t think of another author who tells you less about what his characters are thinking, or their motivations for their actions. For a medium so perfectly designed for psychological free-diving, McCarthy’s refusal to show any cards seems on paper like an insurmountable handicap, but it lends a rich other-worldliness to his prose that is hard to match. But what about Outer Dark specifically? It might be the most quintessentially “McCarthyan” (McCarthyesque?) of his novels that I’ve read (there’s at least 2 I haven’t got to yet). More so even than his masterpiece Blood Meridian, since despite the popular assumption McCarthy isn’t really a Western writer (though he wears the genre well). The through-line to his work is hard-bitten outcast heroes and devilish, almost supernatural villains, and Outer Dark holds plenty of both. For the heroes, you have Culla and Rinthy Holmes, a brother and sister who together have a child. Culla leaves it for dead in the woods, Rinthy finds out and goes hunting for it. The villains are a largely nameless trio of outlaws acting according to their own dark nature. They are less philosophically precise than Judge Holden or Anton Chirgurh, and indeed much of their activity occurs in dense asides between the main chapters. They reminded me, in their sudden and violent appearances, of Flannery O’Connor’s Misfit. I finished the book unsure of the finer points of some events, but with McCarthy you need to take that as a given. He makes me want to be braver in my own storytelling, less inclined to hold the reader’s hand through every plot point and character decision. Even if I can’t cop his style, I think that’s a lesson worth learning.